I used Commie's release for this post, although I highly question why the quality was so bad (I'm pretty sure it was a 480p episode whereas I usually watch 720p). I'll be watching Doki's releases from now on; although I have nothing much against Commie, I'm just more into Doki. I was interested in this anime when I first heard about it during the Fall 2011 Preview post, but I was cautious about it after a slew of "mystery" stories these last few seasons. As I had suspected, it wasn't particularly a mystery anime but rather more of a detective anime, where the focus is the characters rather than the story at hand. Two of the characters introduced this episode - Yuuki Shinjuro and Inga - are obviously going to be main characters, being the detective and his assistant/boss. The annoying girl, Kaisho Rie, is probably going to be a main/recurring character, obviously because her father, Kaisho Rinroku, seems to be Yuuki's main competition. 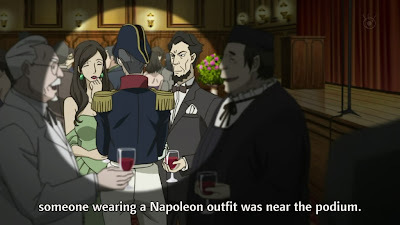 The episode began with Rie feeling annoyed that she would be going to a costume party (in 19th century clothing) held by a hotshot Kanou, currently under investigation for embezzling money. She would be going instead of her father, probably because (like most detectives) he seems to be some kind of recluse. It wasn't that clear from the beginning, but it did become obvious later: Un-Go is set in an alternate universe. The kind of technology shown either exists today or is on the verge of existing (transferring data from two points on connected screens based solely on hand gestures and touches, for example), but the end of the episode talked about the war that had just ended...unless they meant the "War on Terrorism" (which didn't really have that much physical destruction outside of some countries that will remain nameless because I don't want this to become a political thing - let's just say that Japan was definitely not one of them). That's right. You're absolutely as clean as a whistle. On the way to the party, Rie and Koyama Izumi (a prosecutor with experience working with Kaisho) met Yuuki and Inga in the elevator. It's amusing how all that really holds these detective stories up are quirky characters - Gosick had Victorique and Kamisama no Memochou had Alice, and now Un-Go has Inga. As the party got underway, there was a random scene between two important people, Ono and Kanda. These people were affiliated with Kanou in the restoration project after the war finished, using money given by other countries. It was random because I didn't really pay attention (it was more of them just trying to subtly one-up each other in a not-funny way) and because it obviously wasn't important. What about all the other people near the stage? Yuuki was introduced as the Defeated Detective, because he had yet to get a case right despite showing up to most of them and questioning Kaisho's assertions. He noted that his invitation to the party meant that a crime would be taking place and, "surprisingly", it happened pretty quickly. Just as Kanou was coming to the stage to say something about the allegations against him, he showed up with a knife stuck in his back and promptly died. At this time, Rie and Kanou's wife ran back from the bathroom (where they had been since Rie was apparently a very weak drinker), and Rie promptly accused Ono and Kanda of doing the deed. Her sole argument was that several people had said they saw a guy dressed up as Napolean near the stage prior to the murder. My questions are the following:  when did she have time to talk to people? can she not see the obvious flaws of people's memories, such that they would only remember people dressed up (thus standing out), whereas a murderer would dress down, if anything? Apparently, she didn't inherit her father's detective gene. 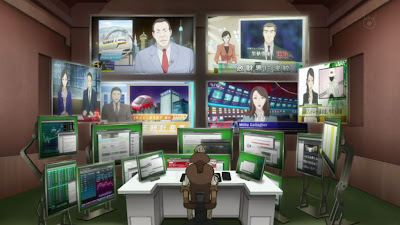 As Kaisho got onto the big screen and told his daughter she was wrong (in nicer words), he pointed out his take on the culprits by showing everyone images of the Special Police present at the event. His thought process was that the SP were present in most gatherings, so people tended to overlook them. Despite the strange flimsiness of his argument, it turned out to seem like the correct one considering one of the SP was found dead in the elevator. As Kanou's wife broke down (again, after doing so once on the stage) and talked about how her husband had gotten framed by the government and so had gotten killed, Yuuki calmly debunked her by questioning why the female was dead in the elevator - and, moreover, why was her jacket off and in the corner? Inga disappeared somewhere and there was an alley scene of shadows as he transformed. I'm not kidding. So is Inga a boy or a girl? 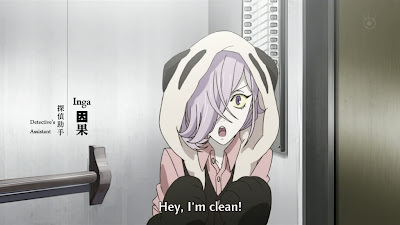 Like I said earlier, Inga is the draw of this anime - the "mascot", if you will. 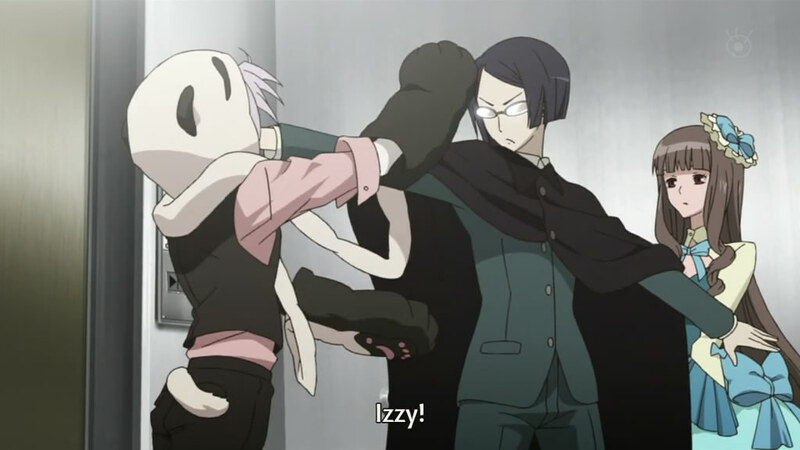 As Yuuki took Rie, Izumi and Kanou's wife to another room, he asserted that it was easy to dress up and pretend to be SP. He suspected that Kanou's wife had actually been the murderer, since she and Rie had been the only two people that had left the room right before the murder occurred. The female SP had gone with them and when Kanou's wife returned dressed as the SP, no one had noticed. 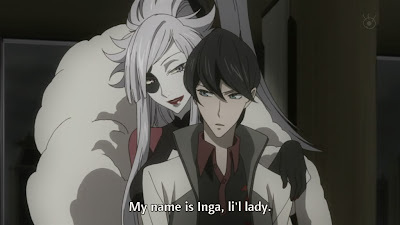 (How lucky that there was an SP that looked just like Kanou's wife, hm...) While the woman furiously denied the claims, grown-up (and female) Inga looking like she belonged in the messed-up world of [C] showed up. 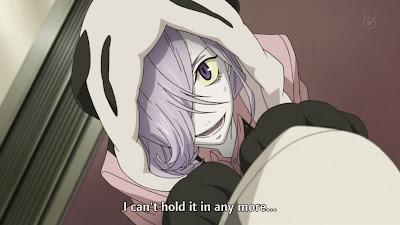 Yuuki claimed that it was his boss, which adds to the confusion of who Inga really is. 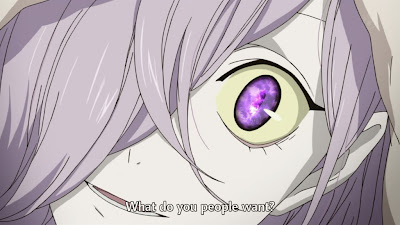 Anyway, Inga's adult-form special talent (because we all have that) was that she could ask a single question that her target would have to answer. Her question to Kanou's wife was what her husband meant to her. Is that a statue of a god? Or outsider art? It turned out that Kanou's wife saw her husband as a hero. He had taken money upon the instructions of other government officials, for a fund that he wasn't supposed to talk about, but after the war was over, people suddenly turned on him, essentially for making it out with so much money. 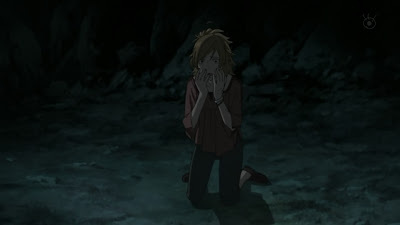 As Yuuki talked to Kaisho (with Izumi's phone), Yuuki insinuated that Kaisho had known all along, and Kaisho's explanation of the situation (to be given to the public) was that Kanou was the target of plot by someone in the government, that the female SP was the one that had killed him, and Kanou's wife (upon finding out) shot the female SP. I don't know whether to buy that Kaisho knew all along or not; there's just not enough to go on. Rie, however, seemed to think that Yuuki wasn't actually the Defeated Detective and that her father was the one who was often wrong. Where did that come from? Finally, I disliked how it was insinuated at the very end that Kanou's wife was delusional and that Kanou actually had just embezzled the money for himself. Perhaps I understood their conversation wrong, but it really seemed that way when Yuuki talked about how to Kanou's wife, her husband was a hero. I hope they reveal what Inga was so fascinated with. I'm hoping that this anime actually decides to explain things about its characters rather than just present cool-sounding concepts. Gosick was going down the right path by revealing many things and the idea of the Grey Wolves sounded great, but then it took a rather strange and rushed path at the end. 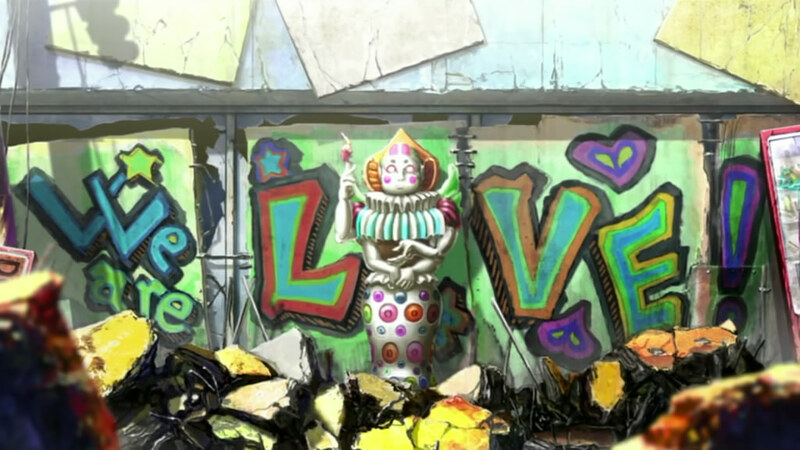 With Kamisama no Memochou, nothing about Alice was ever explained, and I felt a little hollow that such flowery words and lavish sentences were used when there was clearly substance behind them that I just wasn't allowed to know about. I'm hoping that this anime actually explains something, instead of just staying with the "Inga is a cool person" idea. It's a lot to hope for and, judging from history (such as Ghost Hunt), I'm so sure that I'll be disappointed. Something about Yuuki being dead. I won't be blogging about this anime, but I'll keep watching it to see where it goes. So far, this episode used the general detective story layout, including beginning with a random scene containing Yuuki, an unknown blonde girl, and Inga's name, but I know better than to get hooked based on that. It's not about what promises you make, but rather about what you end up showing.